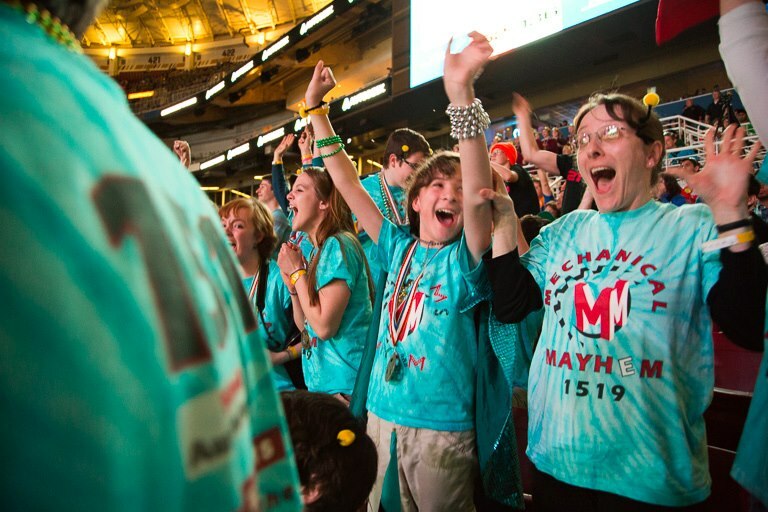 A thirteen-hour car ride in a cramped van from southern New Hampshire to Raleigh, North Carolina was not enough to quench MAYHEMers’ zeal for the long-awaited North Carolina Regional (NCR). 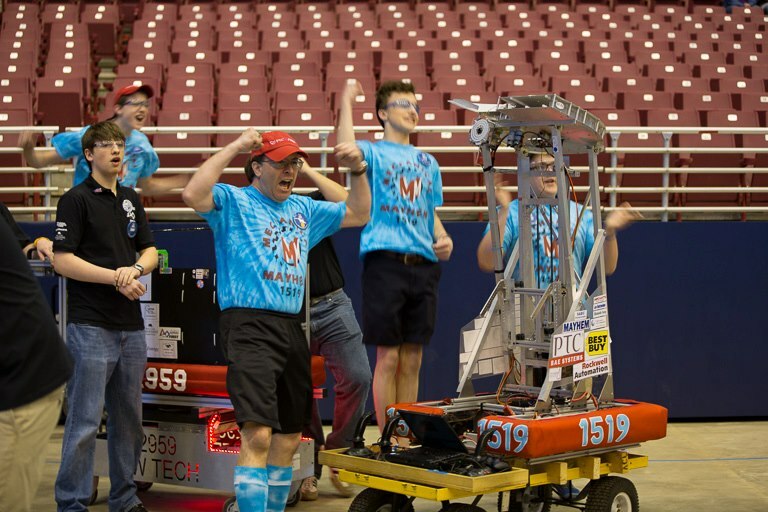 On March 14th, fifty-seven teams streamed eagerly into the breathtaking Dorton Arena, ready to fling Frisbees and climb pyramids. 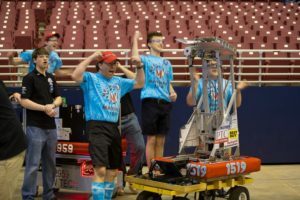 Although many of the teams were rookies, their robust robots were impressive and competitive. One team, The Rembrandts (4481), traveled all the way from the Netherlands to compete. Although the competition was fierce, we ranked 3rd place at the end of seventy-five qualifying matches. 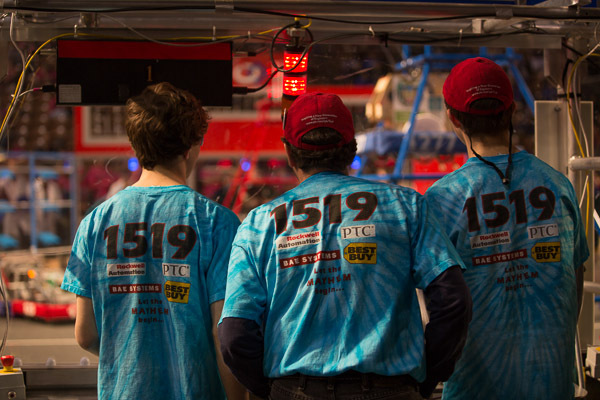 Partnered with the number one seed team, The Robodogs (435), and a rookie team, The Robo Eagles (4828), we continued undefeated all the way up to the final match against the 3rd seed alliance, captained by The Blue Eagle Robotics (1539). 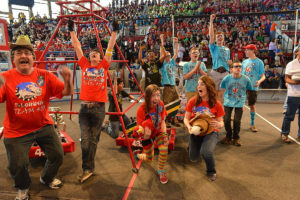 Taking first place, we were extremely proud of our alliance. During the award ceremony, we were honored with the Excellence in Engineering Award, sponsored by Delphi. Winning this regional granted us the opportunity to compete at World Championships, hosted in St. Louis, Missouri. Its name combines the image of the famous Greek sculpture of a disc thrower with its dinosaur-like arms. Towering over the rest of the robots on the field, Discobolus Rex reaches 60 inches tall, focusing on full court shooting from the feeder slots. The robot’s complex climbing system allows it to ascend the pyramid in a 30-point climb. At GSR, our robot ranked seventh out of the fifty-four teams present. 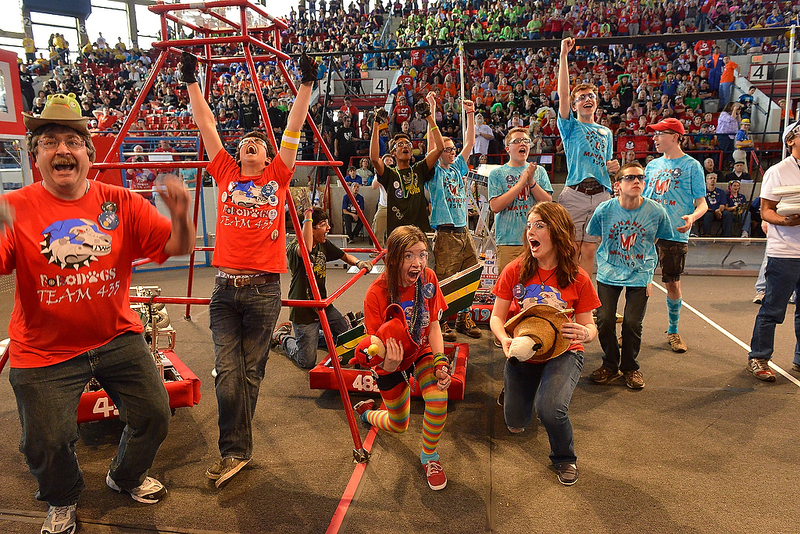 In alliance selections on March 2, we were picked by the Green Team (885) from Vermont. They were one of the few robots that were capable of harvesting Frisbees off of the floor. Together with B.E.R.T. (133), from Maine, our alliance fought strong in the quarter finals, nonetheless, was eliminated in the semi finals by the number one ranked alliance, led by The Coyotes (610), from Canada. At the award ceremony, both of our Dean’s List Nominees were chosen as Dean’s List Award Finalists. Both Aaron P. and Jackson V. are homeschooled juniors with unique leadership skills that contribute tremendously to our team’s success. Saturday, the 5th of January, 23 students and 19 mentors packed into a Milford basement. Their eagerness grew as the clock ticked towards 10:30 am. While the majority of Mechanical Mayhem waited at Mayhem Central, a small posse of tie-dye blue FRCers got situated in the stands on site in Manchester. After eagerly enduring the long hour of anticipation, the whole team watched as Dean Kamen announced this year’s challenge – Ultimate Ascent (2013 FRC Game Animation)! The moment the Frisbee flashed across the screen, Mayhem erupted. On the field, four goals are set at either end along with three feeding stations. The game of three teams against each other to score Frisbees into the goals and, towards the end of the match, climb a three-level pyramid. This game instantly posed a challenging competition. As the following week progressed, Mayhemers gathered nightly to discuss stratagems and brainstorm solutions to the daunting obstacles. According to our analysis of the game, it seemed that a team that could score discs from the protected feed slot would be able to score the most efficiently. Because of this analysis our team decided to build such a robot.